Just read about a great-looking recent book in one of my favorite regular columns, Patrick Smith's weekly "Ask the Pilot." 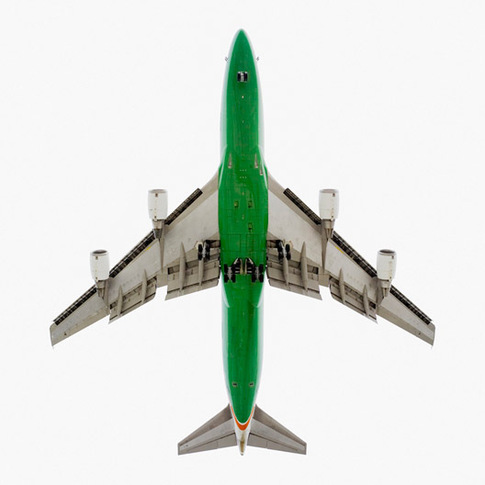 Jeffrey Milstein takes the large-scale, portrait-style photos of aircraft seen here and in the book "AirCraft: The Jet as Art" released a few months back. It's basically a catalog of his recent touring gallery show, one I'm sad to have missed. A pilot himself, Milstein photographs approaching planes near one of LAX's inbound runways with a large-format Contax digital camera. He then strips the background to white in Photoshop, giving his images the stark, scientific tone which allows the unique beauty and power of their subjects to come through. Great work, definitely an art! For art we have to describe what this quote means and we need some help. any ideas? He then strips the background to white in Photoshop, giving his images the stark, scientific tone which allows the unique beauty and power of their subjects to come through. Yay!! They look awesome. I love how you framed them up. I'll have to do some on paper. Incidentally it was on the door side and I was standing right by the door. It took good 5 minutes before we managed to shift bodies enough for doors to open. A lot of fun!